MARTINSVILLE — Martinsville High School principal, Nick Sears, sent out an email last Thursday notifying parents that the school was investigating "graffiti" on a men's bathroom stall door. It also said Martinsville police was involved - but didn't explain why. "I was not notified about a threat. I was notified about graffiti. And that was it," a concerned parent, Nicole Johnson, said. "To me graffiti is, for a good time call. 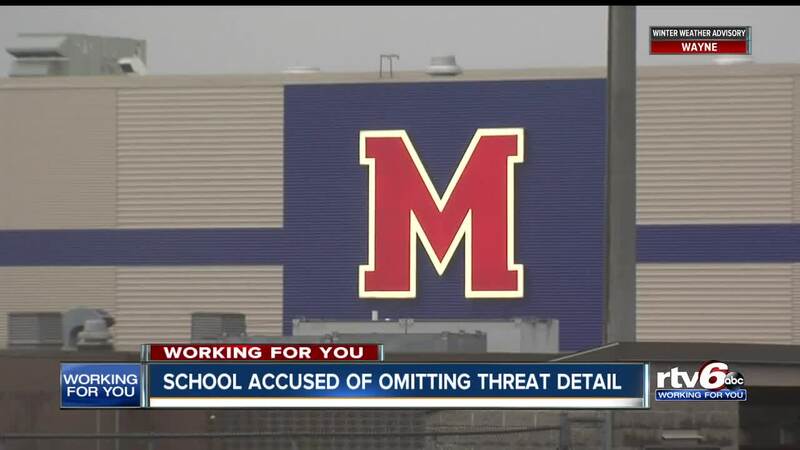 It's not, it's not somebody threatening to shoot up the school." The facts were left out, confusing Johnson and other parents. "We were left in the dark about the well-being of our children when we send them to school," she said. On Monday, officials closed school bathrooms during class as the investigation continued. "Restrooms were locked. None of the students were allowed to go to the bathroom unless they want to the office," Johnson said. Not long after RTV6 started asking questions, the district sent out a new email to parents. This time, including the word "threat" to describe the vandalism. "I just can't understand why all this stuff is happening if they have the situation under control," Johnson said. Martinsville schools is calling the threat unsubstantiated. But in the future, Johnson says she hopes the district will include all the facts from the start.